Nobody Reading Your Blog? What You Need Is a Monkey-centaur. It’s hard enough to claw back time from the demands of life and fiction writing to write a blog post. Why, then, double the time with a search through Google images to illustrate my points? Because that’s where so much of the fun lies. Visual puns, quirky interpretations or just the weirdities that pop up on the web can add a zing that keeps the casual reader going. So today, in fraternal and sororal solidarity, I offer up one of my best sources of free images. The British Library’s Medieval and Earlier Manuscripts blog reproduces illuminations from the manuscripts in their collection. When I contacted them, they said I might reproduce the images in my blog as long as I credited the Library and gave their citation to the manuscript. Hence this monkey-centaur, with which I illustrated the concept of an evil deed. What could be worse than sawing a book in half? Who but a monster would do it? most fun) or on whatever else strikes their fancy. The Library is digitizing its collections as fast as ever it can, and newly digitized manuscripts are frequent subjects of the blog. An international cadre of enthusiasts seem to spend their time crawling through the collection online, and sometimes they find delights that the staff haven’t had time to appreciate. 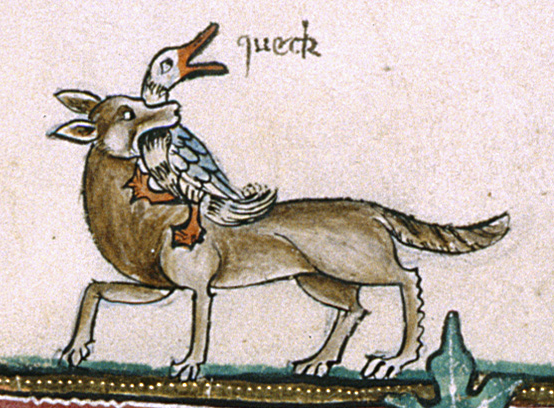 This hapless duck was tweeted out by one Erik Kwakkel of Leiden, who got credit in the BL’s caption. He must have been researching his genealogy. Medieval monks laboring in the scriptorium frequently found their minds directed to the world, the flesh and the devil. Sometimes these showed up in decorous and improving forms. Sometimes not. 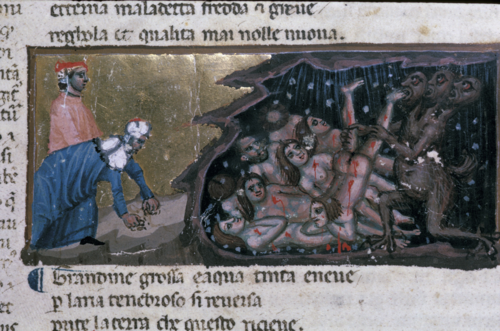 Here we have the punishment of gluttony from a manuscript of Dante’s Inferno. In classical mythology Cerberus was a three-headed dog who guarded the gates of Hades; here he is a three-headed devil who eats those who eat too much. Be warned. Progress has made prudes of us. 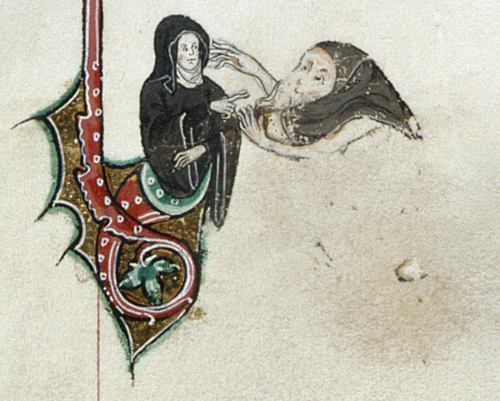 Here we have a nun wagging a monitory finger at a grotesque who is clearly attacking her. 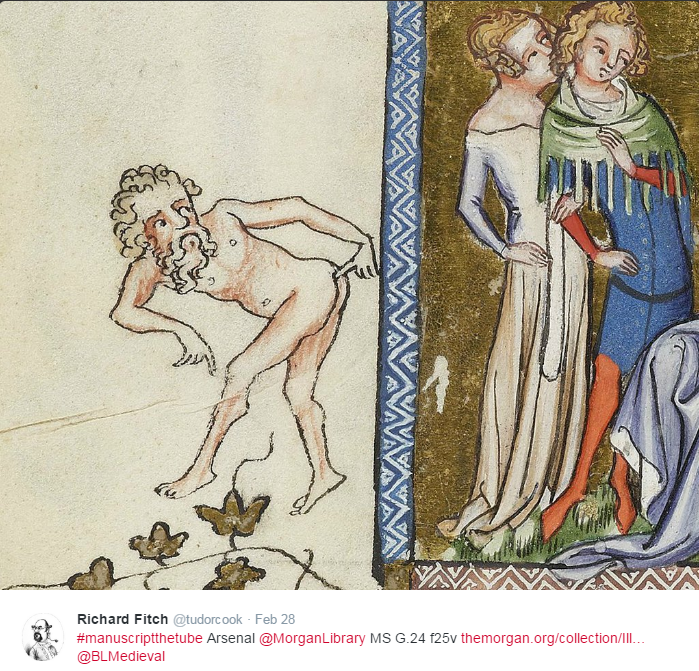 According to the BL manuscripts blog, later owners of such manuscripts often defaced scandalous images in the margins as disrespectful to the pious subject matter. A monk’s envy expresses itself. The BL bloggers passed this on from the Morgan Library’s collection, MS G 24, f. 25v. 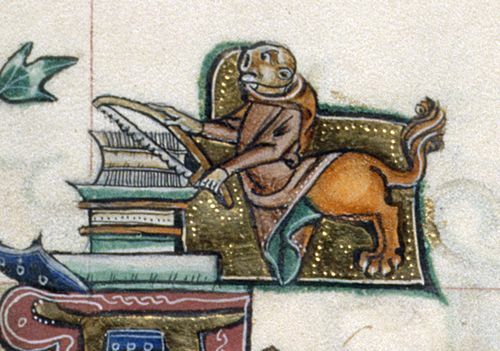 If you’d like some sympathy in your writing woes, check out The Burden of Writing: Scribes in Medieval Manuscripts. Every April 1, a spoof post appears. In one, the digital whizzes at the British Library had introduced flying saucers into the illuminations. Another announced the discovery of an ancient cookbook with recipes for unicorn. I know you get too much email already, but I really recommend following this blog. You’ll find images you can use, and you’ll enjoy yourself, too. Posted on July 17, 2016, in Heidi Wilson, images, Uncategorized and tagged ancient manuscripts, Arsenal, blogging, British Library, fox and duck, gluttony, illuminations, images, monkey-centaur, nun and grotesque. Bookmark the permalink. 1 Comment. “Arsenal”!!! That’s got to be the best….